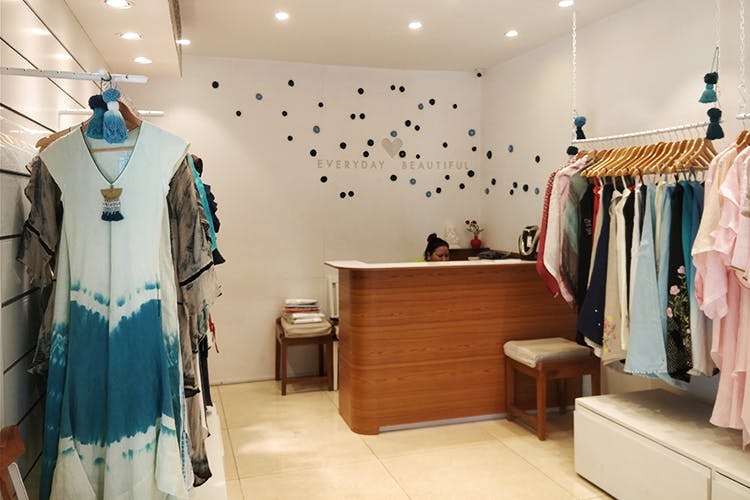 Kaveri on Kasturi Rangan Road claims to sell sustainable linen clothing and tries to answer the ‘Who made your clothes?’ question. Kaveri is already popular on Instagram for its line of sustainable and unique clothing. This boutique opened just 3 months ago, and sells shirts, pants, tops, and dresses that are apparently made from imported linen and hand woven. For its decor and creativity, Kaveri wins 10 points easily, and their collection is one-of-a-kind. They have dresses for different body types and a range of colours to pick from starting INR 1,500. They also have an interesting customisation concept: “Your shirt, your story.” The concept aims to answer the questions: “What forms your biography? What makes you you?” They design super customised shirts with logos and visual aesthetics for customers based on their profession, interests, and their story. It’s like giving flavour to someone’s life through their clothes! For instance, if you need to gift your musician friend something personal, you can get a shirt that reflects their musical style and personality by choosing from existing musician templates and logos the store has. You can even come up with your own and design the shirt. Right from the kind of collar to the logo or words that go on the shirt, you can make it all about you and your story. The shirts start at INR 3,000. Check out their necklaces and potpourri starting at INR 2,000.